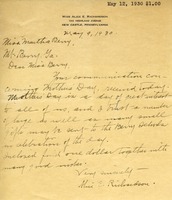 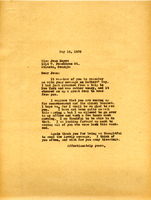 The letter informs Martha Berry of a Mothers Day Committee meeting to review candidates for the American Mother of 1939. 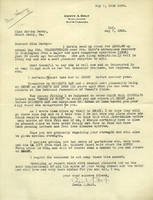 The committee has reviewed nominations and says they will review and decide the nominations at this meeting, which Martha Berry is urged to attend. 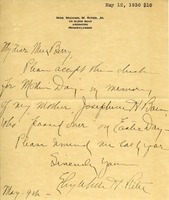 C. Olson writes enclosing a money order as a mother's day remembrance, writing that God will bless Miss Berry and the Schools. 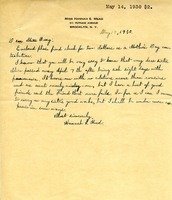 Miss Mead sends a donation to Martha Berry to celebrate Mother's Day. 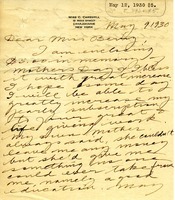 She also informs Berry that her sister, Alice, passed away because of an illness. 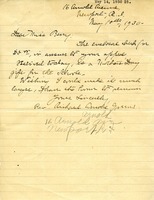 Reverend Greene writes to Martha with a donation for Mother's Day from the church. 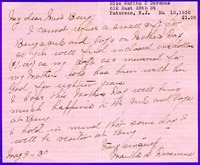 Miss Doremus sends a small donation to Berry on Mother's Day in honor of her mother. 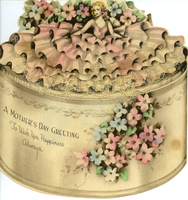 Miss Carswell sends $5 for Mother's Day with hopes to someday increase her subscription. 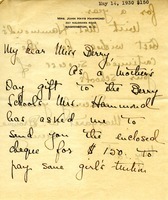 She says that her mother was unable to leave her much money but always said she would leave her somethign better - a good education. 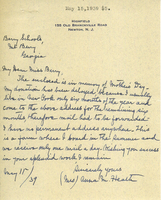 In this letter Martha Berry is imploring friend to donate to the Berry Schools in the Mother's Day spirit.